General Characteristics: Medium in height, erect, stocky, maturing within 12 to 15 months, producing from 2 to 5 oha; recognized by purplish blotching on piko extending along midrib and on primary veins of the lobes, forming a more or less distinct Y.
Petiole: 65 to 80 cm. long, dark green, conspicuously whitish at edge, dark reddish-purple at apex, white for 3 to 4 cm. above base, abruptly curved at apex. Leaf blade: 35 to 50 cm. long, 25 to 35 cm. wide, 25 to 40 cm. from tip to base of sinus, sagittate, vertical, dark green with bluish cast, a dark purple streak on lower surface running from base of sinus to piko; margins slightly undulate; piko conspicuously dark purple, blotched, the color extending along midrib and veins of lobes; lobes acute with narrow sinus. Corm: Flesh white with yellowish fibers; skin cream-colored, occasionally faintly pink along leaf-scar rings. 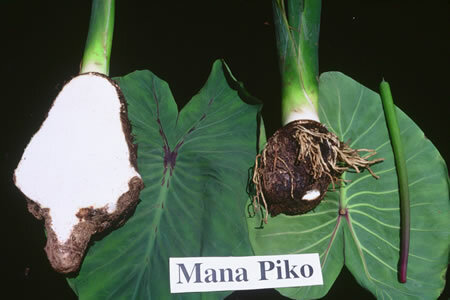 Origin, and derivation of name: Native variety; the name Manapiko refers to the branching coloration of the piko. Remarks: This variety does not belong to either the Mana or the Piko group as the name might imply.